Were one to categorise the degree of chaos we are currently living in, I think it would be apt to give it an "utter" rating. We have reached something of a crescendo though, with dust having crept under every cover and a few walls still to go. But there has been progress. 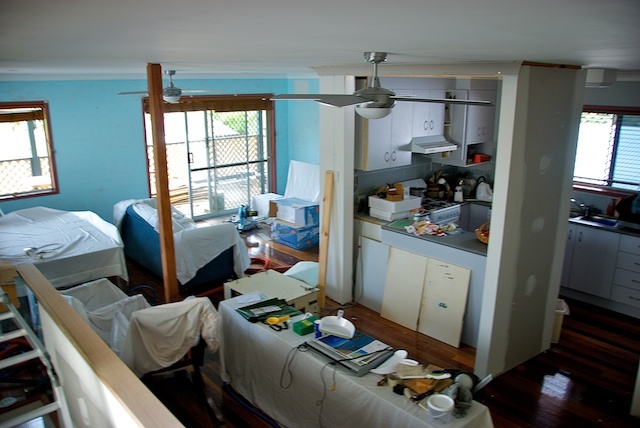 The keen eye may notice the new ceiling fans, which nicely compliment the light fittings now installed, switches and power points might even be functioning by week's end. Of course Brendon our long suffering plasterer is almost done as well, and another two or so days of sanding walls will see me ready to start the sealer coat. That is after I finish the temporary kitchen cupboard extensions of course. We are settling down to a dull roar now though with the messy stuff almost over until the new year when we tackle the ceilings, and we can see an end to the disorder. Perhaps it's not an end, rather just the end of the prelude. On Friday, the chaos returns accompanied by noise as well, the sort of noise that ear protection cannot reduce. On Friday we shall be occupied by things other than building for a few days, as the scruffy horde descends, and the centre of attention turns to grandchildren, all three. Perhaps I shall just snooze on the couch under the covers and they'll be unaware of my presence! Oh dear, perhaps you should have gone to the kids place this Christmas. No Joan, then there would have been no end to it! Now I must start painting tomorrow and clean up on Friday no matter what!